Sliced thin, deep fried and plenty of them! Hand breaded fried chicken breast tenderloins. 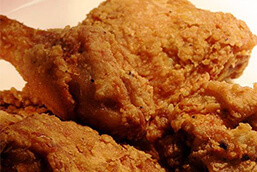 Served with your choice of our own BBQ sauce or ranch dressing. Lightly breaded pepper halves, filled with cream cheese deep fried and served with marinara sauce. A delicious combination of breaded then deep friend shrimp & monetary jack cheese. Four delicious jumbo shrimp, chilled and served with cocktail sauce. Battered fried cheddar cheese, served with our own marinara sauce. Whole mushrooms sautéed in fresh herbs, garlic, butter and wine sauce. Battered and fried mozzarella with our homemade marinara sauce. Fresh Vienna Bread, grilled with garlic butter. Add mozzarella and marinara sauce. 8 oz. of beef slow roasted to perfection. Includes your choice of baked potato, steak fried potatoes, or a side of spaghetti with a hot mini loaf of bread and our famous salad bar. A generous portion of spaghetti, meat sauce and two hand-rolled meatballs. Includes a slice of garlic bread and our famous salad bar. Full rack of tender St. Louis style pork ribs smothered in our own sauce.  Includes your choice of baked potato, steak fried potatoes, or side of spaghetti with a hot mini load of bread and our famous salad bar. Half chicken, served crisp and delicious. 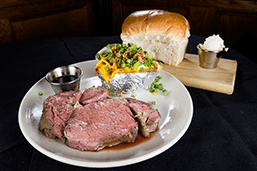 Includes your choice of baked potato, steak fried potatoes or side of spaghetti with a hot mini loaf of bread and our famous salad bar. Sandwiches served with steak fried potatoes and our famous salad bar. 6 oz. of beef slow roasted to perfection, served open face on toast. Lightly seasoned, then grilled and served with our own cucumber dill sauce. Two fillets, baked with a light lemon pepper breading. Served with our own tarter sauce. Seasoned white fisher, baked in your choice of butter or water and served with lemon wedge. Full pound of the Bering Sea’s best! Tender and sweet. Served with butter and lemon. Kind Crab, sautéed shrimp and scallops, layered with fresh spinach, lasagna noodles and creamy white garlic sauce. Topped with Romano and Parmesan cheese. Fresh shrimp, lightly breaded and fried til’ golden brown. Served with our own cocktail sauce. A combination of fresh, lightly breaded, golden fried shrimp and scallops. Served with our own cocktail and tartar sauce. Fresh, lightly breaded scallops fried golden brown. Served with our own tartar sauce. Seasoned fillet, topped with fresh herbs, pan seared until tender and flaky. Choice of baked potato, steak fried potatoes or side of spaghetti with hot mini load of bread and our famous salad bar. Substitute a side of fettuccine alfredo or fresh steam broccoli. Add sautéed mushrooms or onions. A generous portion, served with your choice of marinara or our hearty meat sauce. *Add two hand rolled meatballs. 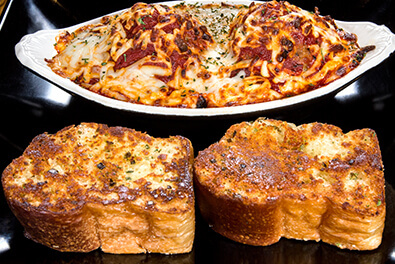 Oven baked spaghetti noodles, blended with your choice of marinara or our hearty meat sauce. Topped with mozzarella cheese then baked til’ golden. *Add two hand rolled meatballs. Fresh wide pasta, tossed in our homemade Parmesan cream sauce. *Add grilled chicken breast, sautéed shrimp or steamed broccoli. Roasted slow and low to perfection, carved to order. 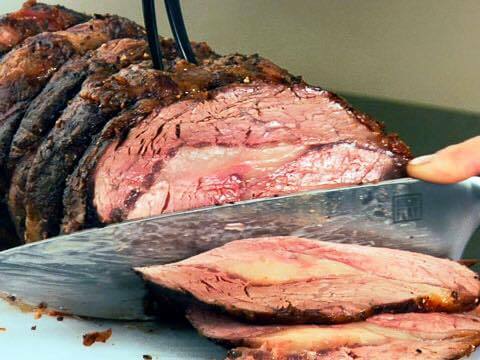 Served with our rich beef au jus. Creamy horseradish sauce available upon request. Served with your choice of baked potato, steak fried potatoes, or side of spaghetti with a hot mini loaf of bread and our famous salad bar. Steak lovers steak, well marbled, juicy, full of flavor. Center cut steak, naturally lean and bursting with bold beefy flavor. Cut from the center of the finest aged tenderloin. Wrapped in bacon, superb taste and tenderness. House favorite! Two 5 oz. center cut medallions, of the most tender cut of corn fed beef. 12 oz. freshly ground sirloin steak. Served with sauteed mushrooms and onions. Cubes of sirloin marinated in our teriyaki glaze, grilled with tomato, green pepper, onion and mushrooms. Cut from the heart of the lion, exceptionally lean and tender. Famous steak flavor. 14 oz. 12 oz. farm raised center cut chip, stuffed with fresh mushrooms, green onions, mozzarella and spices. Two – 8 oz. farm raised center cut, grilled pork chops. Two boneless chicken breasts marinated then grilled to order. Grilled chicken breast & 1/2 rack if St. Louis style pork ribs. 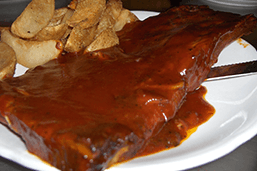 Full rack of tender choice St. Louis style pork ribs, with our own BBQ sauce. Half chicken, super tasty crisp and delicious. *Add our sweet and tangy BBQ sauce to any entree for. Substitute a side of Fettuccine Alfredo or fresh steamed Broccoli.